How to view or recover your saved website passwords from Internet Explorer 10 or 11? In versions 7, 8 and 9 of Internet Explorer, passwords are protected using DPAPI and the login URL as entropy before being saved in the registry. Since Internet Explorer 10, it no longer stores encrypted passwords in the registry, and they’re stored in the Windows Vault, which is the default storage vault for the credential manager information. In this article we’ll show you how to reveal the Internet Explorer 10/11 saved passwords from Windows Vault. With the Internet Explorer Password Recovery program you can retrieve all autocomplete passwords that are stored in the Credential Manager. This can be useful if a user forgot the password before reinstalling Windows. How to Reveal Internet Explorer 10 / 11 Password from Windows Vault? Download and install the Internet Explorer Password Recovery program on your computer. After you’ve installed it, start the program. 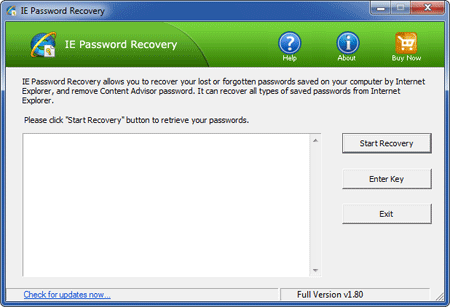 Click on the Start Recovery button, and then select the Recover IE Password option from the drop-down menu. The program will decrypt your website passwords saved in Windows Vault, and display the login information (including website URL, username and password) immediately. Besides revealing Internet Explorer 10/11 passwords, Internet Explorer Password Recovery program can also extract the saved passwords from Internet Explorer 6, 7, 8 and 9.